Douglas TBD-1 Devastator torpedo bombers being prepared for flight prior to the Battle of Midway. (by Victor Davis Hanson, RealClearPolitics) – Seventy-five years ago (June 4-7, 1942), the astonishing American victory at the Battle of Midway changed the course of the Pacific War. American intelligence officers — often eccentric and free to follow their intuitions — had cracked the Japanese naval codes, giving the Americans some idea of the Japanese plan of attack at Midway. American commanders were far more open to improvising and risk-taking than their Japanese counterparts. In contrast, Japanese Admiral Isoroku Yamamoto created an elaborate but rigid plan of attack that included an invasion of the Aleutian Islands as well as Midway. But such impractical agendas dispersed the much larger Japanese fleet all over the central and northern Pacific, ensuring that the Japanese could never focus their overwhelming numerical advantages on the modest three-carrier American fleet. The U.S. Navy was also far more resilient than its Japanese counterpart. A month earlier at the Battle of the Coral Sea, the Japanese suffered damage to one of their carriers and serious aircraft losses on another. The American carrier Lexington was sunk, and the Yorktown was severely damaged. But whereas the Japanese took months repairing the bombed carrier Shokaku and replenishing the lost planes of the Zuikaku, the crippled Yorktown was made seaworthy again at Pearl Harbor just 72 hours after limping into port. The result of such incredible adaptability was that at Midway the Americans had three carriers (rather than two), against four for the Japanese (instead of a possible six). Midway was probably the best chance for Japan to destroy U.S. naval power in the Pacific before America’s enormous war industry created another new fleet entirely. Just months after Midway, new American Essex-class carriers — the most lethal afloat — would be launched. Before the war ended, 17 of the planned 24 carriers would see action. In contrast, Japan launched only four more fleet carriers to replace its growing losses. Japanese naval aircraft — the best in the world in 1941 — were becoming obsolete by mid-1942. In contrast, in the months after Midway, tens of thousands of new and superior Hellcat fighters, Avenger torpedo bombers and Helldiver dive bombers rolled off American assembly lines in numbers unmatched by the Japanese. During the Battle of Midway itself, Japanese Admiral Chuichi Nagumo fatally hesitated in launching his air fleet. He was wedded to rigid doctrine about prepping his planes with the proper munitions. In contrast, American Admirals Raymond Spruance and Frank Jack Fletcher gambled and sent most of the planes they had at the first inkling of the approaching Japanese fleet. Japan could not equal American industrial strength, but American aviators and seamen could certainly match the Samurai courage of their Japanese counterparts. At Midway, 37 of the 41 slow-flying and obsolete American Devastator torpedo bombers lumbered to their deaths, as they were easily picked off by Japanese air cover. But such heroic sacrificial pawns drew off critical Japanese fighter protection from the fleet. In its absence, scores of high-flying Dauntless dive bombers descended unnoticed to blast the Japanese carriers with near impunity. Americans took chances to win an incredible victory. The Japanese command chose to play it safe, trying not to lose advantages accrued over the prior six months. 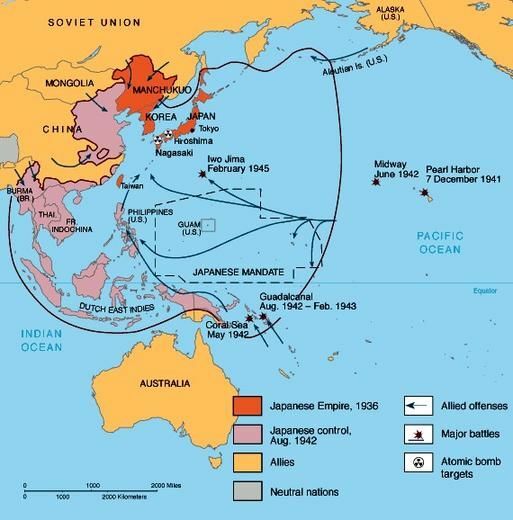 Midway was not the beginning of the end for Japan. Just five months later off the island of Guadalcanal, only one American fleet carrier was left undamaged in the Pacific after a series of brutal sea battles. Instead, to paraphrase Winston Churchill, the victory at Midway was the end of the American beginning. 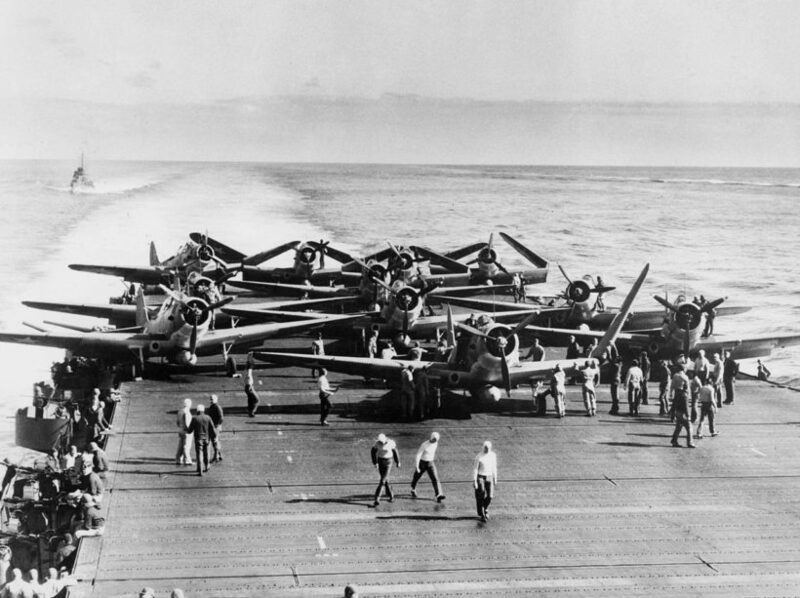 Before Midway, the Americans had rarely won a Pacific battle; afterwards, they seldom lost. America’s culture of spontaneity, flexibility and improvisation helped win the battle; Japanese reliance on rote probably lost it. We should remember those lessons 75 years later. Published May 18, 2017 at RealClearPolitics.com. Reprinted here on May 25, 2017, for educational purposes only. May not be reproduced on other websites without permission from RealClearPolitics. PLEASE NOTE: Regular posting ends for the school year on Friday, May 26th. Visit links under “Resources” for videos about Battle of Midway. 1. Tone is the attitude a writer takes towards his subject: the tone can be serious, humorous, sarcastic, ironic, inspiring, solemn, objective, cynical, optimistic, encouraging, critical, enthusiastic… Which word do you think best describes the tone of Victor Davis Hanson’s commentary? Explain your answer. 2. The purpose of an editorial/commentary is to explain, persuade, warn, criticize, answer, entertain, praise or inspire . What do you think is the purpose of Mr. Hanson’s editorial? Explain your answer. 3. How does this commentary inspire you?